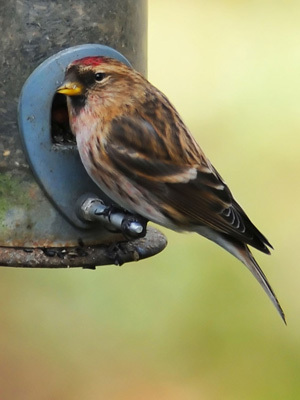 This page gives you the latest bird and wildlife news from Chew Valley Lake (and sometimes elsewhere if there's something good about). Records are taken from various sources and should be regarded as unconfirmed. When you visit Chew, please remember that you'll need a permit to enter the lake enclosure or use the hides. You can get one from Woodford Lodge, the Tea Rooms, or by post. See my access page for full details. Seen anything good? Please contact me. Doing shopping? Please consider supporting this website by using the hyperlink opposite. Many thanks! Last call for records for the 2010 Avon Bird Report. Please send all your records to John Martin at avonbirdrecorder@googlemail.com. Any editorial stuff such as photos should be sent to Harvey Rose H.E.Rose@bristol.ac.uk. Thanks! An adult Ring-billed Gull was seen in Heron's Green Bay all morning and into the afternoon (evidently not the bird seen on 19th); it flew off north at 14:00. Also a Peregrine there. 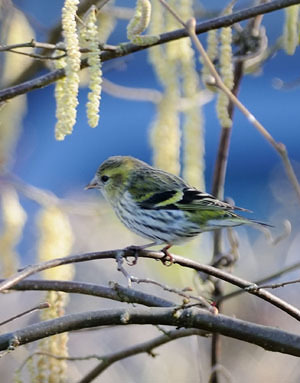 Thanks to Richard Keel for sending me the two photos (right) of both Siskin and Redpoll visiting his garden in Bishop Sutton this weekend. A female Greater Scaup at Herriott's End and a Curlew in Villice Bay were both new today. Two Mediterranean Gulls were seen from Herriott's Bridge this afternoon. An adult female Greater Scaup at Herriott's End and a Curlew in Villice Bay were both new today. A Little Egret and the first-winter male Greater Scaup were in Heron's Green Bay this afternoon. An adult Kumlien's Gull was found in Stratford Bay at 14:00; it flew into the roost and was watched off Nunnery Point until 17:00. Also an adult Mediterranean Gull there. At least three adult Mediterranean Gulls were seen in the roost this evening. There was evidence of two other species today by the signs they had left - an Otter spraint on the causeway at Herriott's Bridge and a few Lunar Hornet Moth larval workings on some recently-felled sallow stumps at Sutton Wick. An adult Ring-billed Gull was seen at Herriott's for ten minutes this afternoon before flying off SE at 14:40. The Black Redstart was seen at the jetty by Woodford Bank this afternoon - strange that we've have had our first ever overwintering Black Red in a winter where Stonechats have been noticeable by their absence. Three adult Mediterranean Gulls were seen in the roost off Sutton Wick this evening. A Greylag was seen with the Canada Geese at Woodford today. A Bittern was seen in flight over the main reedbed and Stratford Bay this morning, with two birds seen later at Herriott's Pool. A White-fronted Goose was also seen at Herriott's this evening, as were a Barn Owl and adult Mediterranean Gull. A Green Sandpiper and a Greater Scaup were in Heron's Green Bay. 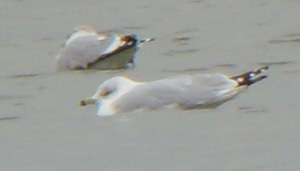 Two Mediterranean Gulls were seen in the roost from Moreton hide. Two Greater Scaup were seen in Stratford Bay, and at Nunnery Point this afternoon a Grey Plover was heard calling and two adult Mediterranean Gulls were seen in the roost. A Bittern was seen at Stratford Pools this morning. The reappearance of a male Ferruginous Duck at Herriott's End was arguably the most exciting thing to happen all day; otherwise a decent count of 1150 Pochard and 175 Shoveler were the highlights of a duck count which saw some big reductions in numbers from only a few weeks ago. Other counts as follows - 11 Goosander, one Red-breasted Merganser, 11 Wigeon (down from 155 on 1st), nine Pintail, 36 Gadwall, three Green Sandpipers and 12 Dunlin. The Black Redstart was still at Woodford Bank, 80 Linnets were counted in Villice Bay (a good number for recent years) and five Mediterranean Gulls were seen in the roost. Ten Dunlin, a Little Egret and ten Siskins (Moreton) were seen today. Birds seen today were the Black Redstart (Woodford), a Barn Owl (Heron's Green Pool), 24 Dunlin (Stratford), one Little Egret (Heron's Green Pool) and the male Red-breasted Merganser (Moreton). Most of the lake's Goosanders were hauled out along the shore at Moreton this weekend, as was the male Red-breasted Merganser. A strong westerly wind had most of the wildfowl sheltering along the western side of the lake; a Ferruginous Duck x Pochard and the male Red-breasted Merganser were the pick of the bunch, and there are still good numbers of Teal tucked away along Moreton Bank and other such unviewable places. 26 Dunlin were at Stratford hide, 30 Linnets were at Villice Bay, and two Mediterranean Gulls were seen in the roost.